Dr. Carskadon’s presentation focuses on the biological causes of the delay in sleep timing that occurs during adolescence, whereby the natural sleep-wake cycle shifts later in the day. 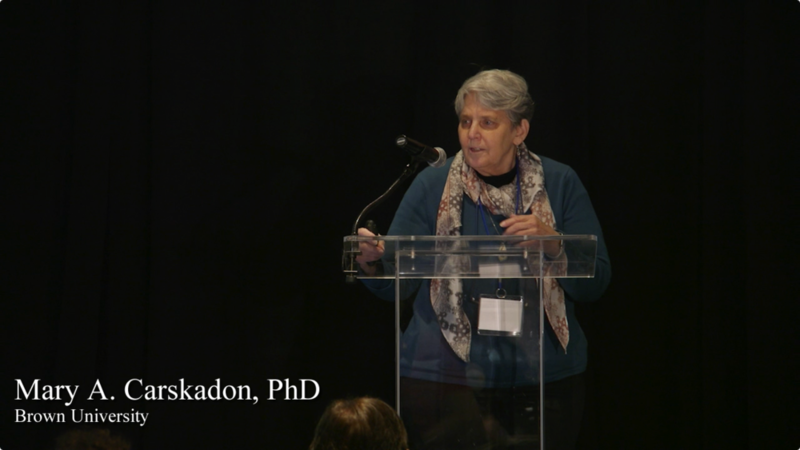 Dr. Carskadon explains that the human brain undergoes enormous structural changes during adolescence and discusses the changes that occur in the circadian timing system and the homeostatic system that regulate sleep. To underscore the biological source of this change, Dr. Carskcadon notes that a sleep-timing delay also occurs during adolescence and pubertal onset in other species of mammals. Dr. Carskadon presents research that demonstrate that the release of melatonin, “the hormonal gateway to sleep," shifts later in the day during adolescence, while the amplitude of the melatonin signal falls. Research has also found that adolescents experience a greater sensitivity to evening light, associated with a delay in circadian timing. As it relates to homeostatic drive, or sleep pressure, Dr. Carskadon presents research measuring slow brain wave activity and sleep propensity showing that the homeostatic system also undergoes significant changes during adolescence, resulting in a slower accumulation of sleep pressure during the course of the day. The conclusion is that sleep’s two main bio-regulatory systems both undergo changes during adolescence that operate to shift the natural sleep-wake cycle later in the day.